Toro Muerto petroglyphs is located to 164 km / 102 miles northwest of Arequipa (2 hours and 30 minutes in bus). Leaving the Colca valley and passing through the Sihuas pampas is one way to get there. To arrive there directly from Arequipa, take the road to Lima and turn off at Corire (District of Uraca) and drive for 6 km / 4 miles. The site consists of a group of carvings spread out over 5 km2 / 2 miles2. 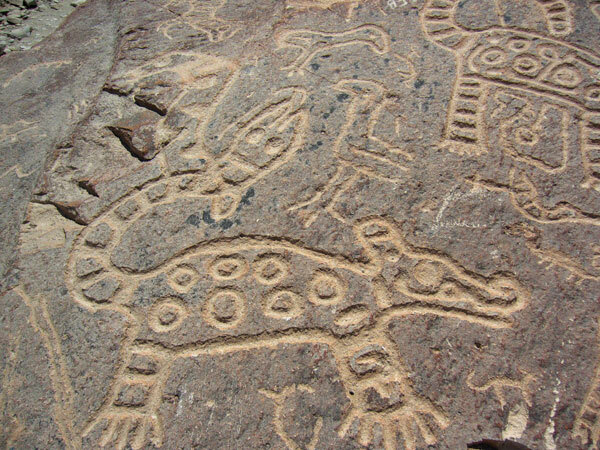 The majority of them are representations of human beings, animals, and plants, as well as geometric designs that seem to have been carved with sharpened stones. The techniques used varied from striking, scratching, chipping, to hammering, and their age could begin around 1100 A.D.
Also you can go to see pre Inca tombs, as well as Tracks of the Dinosaurs (Querulpa), located between Corire and Aplao (700m). After expend 4 hours explorer this place, before returning to the South Panamerican highway and come back to Arequipa.